Then Get Ready To GO! THE OFFICIAL RECORD LABEL OF MATCH-TIX! Match-Tix Group Sales is New York's most innovative Broadway and Off-Broadway theatrical marketing and sales force in town. Comprising a staff of Broadway professionals who are experts in their chosen field with over 30 years experience in theatrical marketing, Box Office, Group Sales, National Tour Marketing, and even on Broadway stages  yes, some of the Match-Tix staff are Broadway stars too! Talk about full service! Match-Tix offers personal shopping for its clients. We do everything from start to finish and pride ourselves in going the distance for EVERY customer. In this day and age of theatre ticket prices soaring through the roof, we believe every client should be guided through each transaction with ease, patience, expertise and fun too! Our relationships with our clients have been successful for many years because we are not assembly-line order takers. Attention to every little detail and concern for our client's needs have only made our relationships stronger year after year. Match-Tix is part of a ticketing network of associates who enable us to facilitate your special requests and orders for your group sale or theatre party with more thorough results. Our associates in the field will help embellish all of your group's additional requirements for your trip to New York City and Broadway. Restaurants, Hotels, Sightseeing Tours and Excursions can all be arranged for your entire theatre trip. Our Educational and Tourism partners work closely with us to customize field studies for theatre trips as well. As a result, we have one of New York's strongest relationships with the educational sector coming to the Tri-State area! Match-Tix can coordinate all aspects of your theatre experience from basic Meet and Greets with the casts of virtually every production to private tours and special events. Helpful Hint: Be prepared to have a couple of dates to request... your order is even easier to fill if you give us as many options as you may have! Did we say discounts? That's right, last but not least, the NUMBER ONE REASON to be part of a group to attend a theatre activity is to take advantage of special lower prices that you would not be eligible for otherwise. Discounts for Broadway and Off-Broadway shows vary anywhere from a standard 10% up to 40% off the ticket price in some cases! And don't be surprised to get a 50% discount to some shows. And we'll even give you pointers about special super savings during off-peak seasons where you can save even more on some of the biggest shows in town! We will be happy to make recommendations to you on shows that will be appropriate for your specific group's members, tastes, age demographic and sensibilities. We will hold your hand through the very simple, painless ordering process and make sure that all of your special requests are satisfied. Once your group sale is confirmed which can take from 15 minutes to 2 days later depending on the show, you then will receive an informal contract or invoice for your records. Simply follow the easy instructions for payment- you won't have to pay right away either  depending on how far out your selected date choice is, you'll be given ample time to collect funds from your group members, colleagues, associates or friends! After we receive your payment, your transactions are then finalized. Simply wait for your tickets to arrive by certified mail in most cases. For more information about group sales policies, payments and services, please click on our FAQ pages. It's all there... and then some! Great advice, personal shopping, private consultations, "inside" information... It's all part of our "People to People" service! Browse around the Match-Tix site. It's very simple to navigate from one show to the next. We'll guide you in making the right decision about what your group should see. Now more than ever before, Broadway has so much more diversity. New Musicals, New and stimulating Plays, Landmark Revivals and Special Limited Engagements with your favorite Hollywood and Television stars! Welcome to Match-Tix... Welcome To The Theatre! 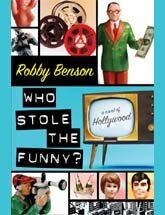 Broadway, Film and TV's ROBBY BENSON has a great new novel to add to your reading list! Buy it NOW at Amazon.com! Casts, Performances, Schedules, Prices, Discounts are subject to change and availability.